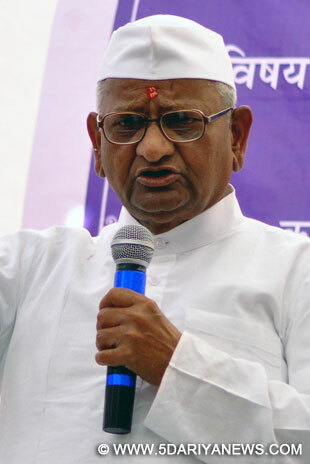 Social activist Anna Hazare Monday asked people to vote for "clean candidates" in the coming assembly elections in Maharashtra to ensure all-round development.In his first statement after the Lok Sabha elections, Hazare said people must seriously ponder why corruption, atrocities on women, crime in politics and loot of public money have increased in recent times. "The temples of democracy - like parliament and assemblies - must have clean people as significant decisions on the well-being and development of the country and the states are taken there," he said.However, in the recent past, voters have sent to the legislatures people who are corrupt, with criminal background, which has resulted in the prevailing dismal scenario, he said. "The key to bringing about a change in the polity is in the hands of the voters. They should swear in the name of the country and martyrs like Bhagat Singh, Sukhdev and Rajguru and ensure that they will not vote for corrupt, criminals and dacoits to these temples of democracy," Hazare said. The 77-year-old anti-corruption activist expressed confidence that if each voter thinks and acts accordingly, it will result in a sea change in the country's polity.Hazare called upon political parties to refuse party tickets to people with such unsavoury background in the best interests of the society and the nation.He reminded the people that they were "kings" with such an enormous power of a vote given to them, and they must now decide to reject such candidates. "The voter is supreme compared to political parties. Their votes have the power to change the nation/state, but it is never utilised in the true sense. Some fall prey to liquor or a few rupees or caste-community considerations," Hazare observed.He said that if the voter becomes aware and votes consciously (in the coming Maharashtra assembly election), they will witness a change in the state within five years.Elections in Maharashtra are scheduled to be held later this year. Anna-Mamata bonhomie a marriage of convenience?